When It’s the Will of God It Works! Zola Levitt came to know Yeshua as his Messiah—Savior. When retelling his story, he often mentioned how he would sneak through the darkness to the Campus Crusade director’s house, like Nicodemus, to learn more about his newfound faith in Jesus. As Zola became an avid student of the Scriptures, he became burdened for his unbelieving Jewish friends and family. He also noticed that the New Testament Church generally neglected the teachings of its Jewish roots. So, he answered the call of God to set out on a journey to educate the Church, his Jewish friends, and family. In the process, he became one of the staunchest supporters of Israel around during his lifetime and even to this day. Zola, shown here with a younger Benjamin Netanyahu, was a staunch, faithful friend and defender of Israel. Zola often repeated the advice he followed: “Choose a job you love, and you’ll never work another day in your life.” Through his years of ministry, Zola taught thousands in person, ministered to millions via television, and escorted thousands to Israel—God’s Holy Land. I recently was reading an archived Levitt Letter in which Zola invited people to tour with him in Israel. He made the comment to his readers that once the tour pilgrims were introduced to him, most of them never conversed with him again—noting that the tour wasn’t about him. Today, many challenges confront Zola Levitt Ministries, but it is still God’s ministry. Every organization I’ve ever known or been associated with has gone through changes—from personnel to financial to sometimes a “reboot” in order to adapt to quickly changing media and print environments. Zola Levitt Ministries continues to this day because it’s the will of God—plain and simple! 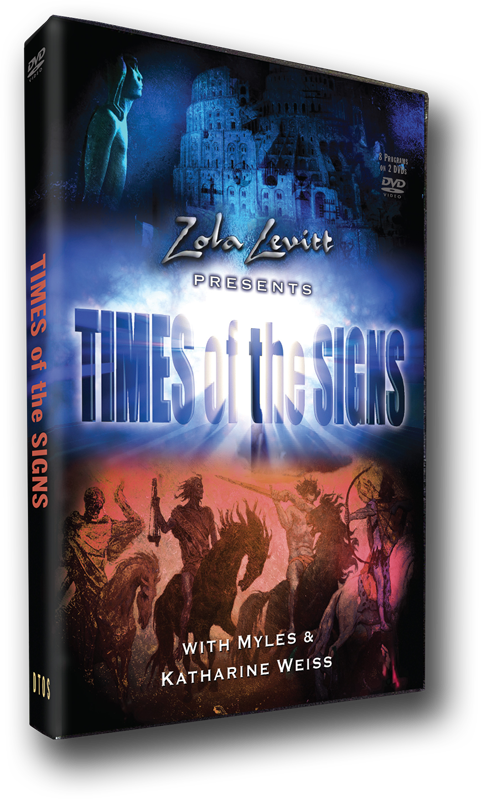 The ministry’s cast of characters (that’s not a derogatory statement, because God used a cast of characters to reveal His truth to us through the written Word) are convinced that they’re in the will of God, and the board of leadership remains convinced that the ministry is on track to accomplish what God called Zola to do years ago. Today is a different day, with different methods and different people, but the purpose hasn’t changed. One more point: I want to call your attention to Romans 8:28–30. Please read the verses aloud and meditate on them for a few moments. They do not say that all things are good. They do not say that all things work toward the good of everyone. They do not say that all will be conformed to the image of His Son. God causes all things to work together for the good of those who love Him. Those who love God have a great purpose to fulfill in this life. His tapestry of workings in the life of those who love Him conform them to the image of His Son. All those being conformed will be justified (saved) and glorified (receive their rewards). I felt compelled to take a few liberties in this letter. This Personal Letter is truly my personal letter to you. I believe that the people (including our volunteers) involved in the daily operations and production media (print, broadcast, Internet) of Zola Levitt Ministries truly fit the above criteria—they love God! And whatever contribution of time and energy they give puts them on the road to being “conformed to the image of His Son.” Isn’t that what all Believers (“Believers” is short for “believers in Yeshua/Jesus as Messiah.”) want? Staying the course in ministry is difficult. Even the beloved Apostle Paul noted his struggle in Romans 7. Ask anyone in ministry and they will tell you that not all things are good, but that all things combined by God bring completed and rewarding results. What happens when someone doesn’t stay the course? Robert Robinson was born in England more than 200 years ago. When he was just a boy, his father died and his widowed mother sent him to London to learn the barbering trade. While in London, he found salvation under the preaching of the great revivalist George Whitefield and soon began preparing for a lifetime of serving Christ. At age 25, Robinson was called to pastor a Baptist church in Cambridge. He was successful, but his popularity was more than the young minister could handle. Ultimately, he fell into a life of sin. The years faded and his devotion to Christ was forgotten. Years later, while making a trip by stagecoach, Robinson happened to sit next to a woman who was reading a book with obvious pleasure. She seemed to be especially interested in one particular page. Finally, she turned to Robinson—a complete stranger—and, pointing to the hymn she had been reading there, asked what he thought of it. He read no farther. He tried to direct the woman’s attention toward the passing scenery. She would not be deterred but told him about the benefit she had received from the words of that hymn—expressing her admiration for its message. My prayer is that Zola Levitt Ministries will continue on the God-inspired path of its founder and never listen to the “other” voices. My prayer also is that you, Dear Reader, will understand the dangerous path down which other voices can lead you. May God find us all faithful to our calling when He comes! Isaiah 43:18–19 tells us that God does new things: Forget the former things; do not dwell on the past. See, I am doing a new thing! Now it springs up; do you not perceive it? The new things “springing up” at ZLM are exciting. In the very beginning, God created. He still actively creates. ZLM’s changes are examples of God saying, “See, I am doing something new!” The best part: We get to be part of what He is accomplishing. When you support ZLM, you actively engage in creating remarkable ways of reaching out to improve lives. What an opportunity! This ministry can’t and won’t survive without its supporters catching the vision of God creating something new. Focusing on the past can blind us to recognizing new possibilities that God wants to bestow through ZLM. Thank you for being a vital part of this ministry. Please join us on our weekly television broadcasts. You can also watch Zola Levitt Presents current and past episodes online at levitt.tv. Zola had a heart for conveying Christianity through Jewish roots, and Kirsten and I are honored to be a small part of his legacy. In a world filled with harsh scenes and cruelty in the media, this ministry strives to bring you hope, words of encouragement, and Good News. In November, we conclude our series Times of the Signs. In this eight-program TV series, Myles and Katharine Weiss encourage Believers to look beyond the troubling prophetic signs of our day and live in growing expectation of our Messiah’s return. The spiritual battle with radical Islam is wearying, but we mustn’t give up; the Lord wants none to perish (2 Peter 3:9) and will return for His own. Signs such as increased knowledge, new technology, Jewish return to Israel, and the growth of Messianic congregations point toward the return of the Messiah. Yeshua is coming for His bride, and we want no one to miss out. Then we reprise Esther: For Such a Time as This. 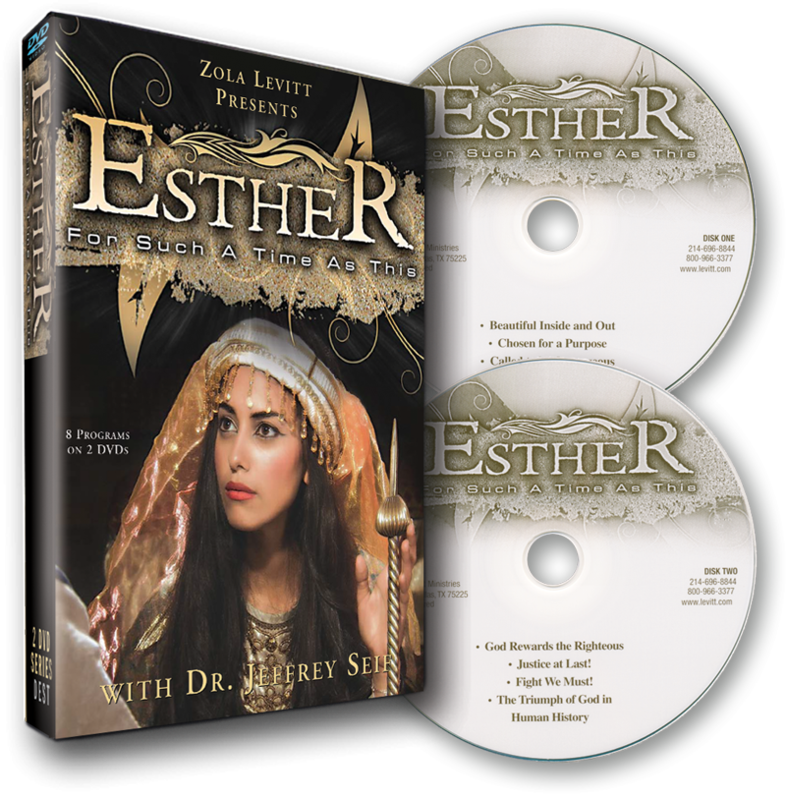 The Book of Esther is one of the Jewish people’s favorites. David and Kirsten Hart present this eight-part series with teaching from Dr. Jeffrey Seif, dramatic reenactments, Hebrew lessons, and music from Ted Pearce. Like Esther, we Believers may be alive for such a time as this. Does God use women? Yes! In Esther’s rise and Queen Vashti’s fall, we see how God elevates individuals to places of influence—then as now. Though wickedness surfaces in every generation, God positions His people to thwart the devil’s plans and fulfll His own. We examine Mordecai and Esther’s placement … and our own; for we, too, are called to God’s work. Faced with a plot to destroy the Jews, Esther wavers but decides her sacrifice is worthy: “If I perish, I perish!” May we all have such resolve! P.S. Would you kindly lend an extra measure of support as we create our new Isaiah series? It will feature a favorite topic of our guest teacher, Baruch HaShem’s Messianic pastor, Marty Waldman: prophetic clues about Yeshua. This year’s three back-to-back hurricanes, however, have taken their toll on our ministry’s finances by diverting support we need for our film crew to shoot footage in Israel. Thanks in advance for your help. I am committed to standing with Zola Levitt Ministries as God’s mission continues on television, through the mail, and at levitt.com. Here is my donation for November. Please use it to continue the visionary mission of Zola Levitt as he was called by God, the Potter. These programs celebrate the timeless teachings of the late Zola Levitt, one of the most beloved Bible teachers in America. Highlights from thirty years of television broadcasting are condensed into four half-hour programs that examine Zola’s early, mid-career, and later teaching. Trademark, on-location footage from Israel gives viewers insights into the biblical world and Word. These two television productions are dedicated to the viewers and readers who have loved Zola like a family member. “Remembering Zola” was recorded at Zola’s memorial service and includes video highlights of past telecasts and special music as well as tributes to a never-to-be-forgotten warrior of the faith. “In Loving Memory,” is a tribute to Zola by those who knew him best. His widow, Sandra Levitt, talks with Zola’s family, friends, and co-workers in this special half-hour reminiscence of a man who planted seeds of faith in millions of lives. This collection combines all of the music television that our ministry used to offer on three separately packaged VHS tapes. Our production team made a special effort to pair on-location video footage with Zola’s favorite music selections presented here uninterrupted. Zola accepted Jesus as his Messiah on March 14, 1971. Within several years, he authored a dozen books and hosted a live talk-radio program. Zola’s ministry expanded to television. Zola produced over 700 hours of television that reached millions. This retrospective series brings you a few highlights of Zola’s work, music, and life.